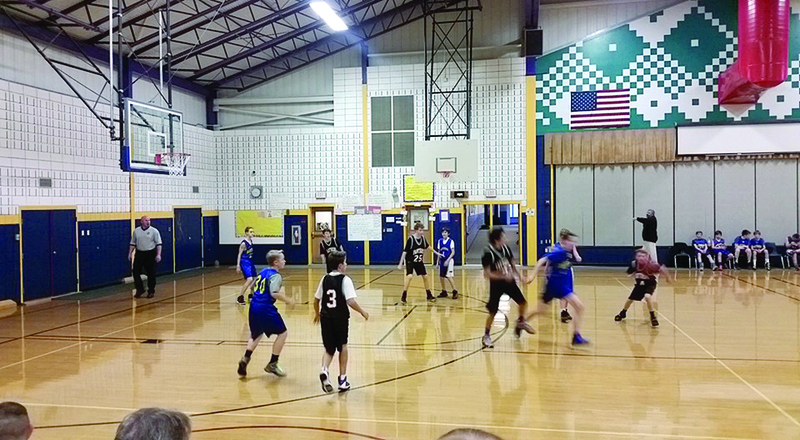 The Jordan-Small Middle School, (JSMS), basketball teams have kicked off their seasons. JSMS features four teams as there is an A and B team for both girls and boys. Starting with the B girls team, coached by Lynne Estey, they have gotten off to a 1-1 start. 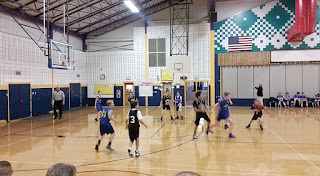 The team beat Buckfield in their first game, and lost to NYA on Tuesday. "We are large in numbers, but large in heart as well," said coach Estey. "They are a great, cohesive group, led by my three captains, Ashlee Bernier, Danessa Jackson and Norma Easter. We have a great balance of experience and youth, I'm excited to see them progress the rest of the way," she said. Estey brought in four sixth graders, Ellie Miller, Sara Hare, Sorcha Shalom and Amanda Foss, to help round the team out, and they have stepped right in to be contributors. Seventh graders are Lily Benton, Hailey Landman, Kaylee Welch, Ember Young, Arianna Tripp, along with the captains, Bernier, Jackson and Easter. The B boys team is coached by Gary Stone, and assisted by coaches John Dionne and player/coach AJ Mains. They also are off to a 1-1 start. Losing the first game of the season to Buckfield, the boys bounced back on Tuesday against NYA, with a buzzer-beating shot by Robbie Soucy to secure a thrilling 26-24 victory. making great strides and I like that we are getting better as we go, even if that doesn't translate into a win," he added. The B boys are very athletic and play hard on both ends of the floor. Players are Cam Wescott, Alec Brooks, Nathan Plummer, Jayson Plummer, Louden Greene, Mark Gedicks, Trenton Valeriani, Soucy and Mains. Wescott is a full time swing player up to the A team as well. Soucy and Plummer, (Nathan), have also enjoyed A team call ups so far. The A girls are off to a hot start, going 2-1 in their first three games. Coached by John Powers, the Lady Roadrunners feature an aggressive defense and sharp shooting on the offensive end. Players are Ellie and Whitney Wilson, Callie and Shyler Fielding, Lyndsey MacDonald, Lexie Bailey, Makenna Colby and Hailey Applebee. "They work well together and play as a team," said coach Powers. "They work really hard in practice and it shows during the game. I'm excited to see what we can do the rest of the way," he added. The A boys ran into two powerhouse teams, (Lake Region and Waynflete), to start the year, but did get a nice win in their last game over Old Orchard Beach, to improve to 1-2 so far. The boys are young and inexperienced, but work hard game in and game out. They are coached by Jim Beers and Lynn Campbell. Players are seventh graders Niall Gushue, Dominick Campbell and swing player from the B team, Cam Wescott. Eighth graders are Ivan Kaffel, Lucas Pongratz, Ben Childs, Brendan Saunders, Jack Hutchinson and Davis Kinney. Kaffel has led the team in scoring every game. "The boys play with heart and are getting stronger as we go. We as coaches couldn't be happier and more proud of the effort so far," said coach Campbell. PIC 1:-- JSMS B boys in action vs. NYA.